Chappie fails to live up to its trailer as the filmmakers instead go in the sappy direction to get a broader audience despite its R rating. With big names like Hugh Jackman and Sigourney Weaver attached to the film you would expect more, I blame the Director for being lost in trying to do too much taking mismatched pieces from various films, instead of trying to produce a good action packed Sci-Fi film. The movie is about the replacement of humans with a mostly robotic police force of robots called Scouts in South Africa. The story focuses on their young creator Deon Wilson played well by Dev Patel giving "Artificial Intelligence" to one of the Scouts making him sentient. The struggles of the film involved Chappie, the sentient scout as he learns about what it means to be alive and the gangsters that seek to control him for wealth against the wishes of his maker Deon. As well, we have Hugh Jackman who plays another engineer Vincent Moore who wishes his Mech, the Moose would be utilize instead of the Scouts. Like I said before, too many things going on and not any bit in a good way. The characters starting with the gangsters are laughable which may be probably what the filmmaker's intention was. Take their color guns for example. Part of the process of gangstering up Chappie is teaching him to be tough. 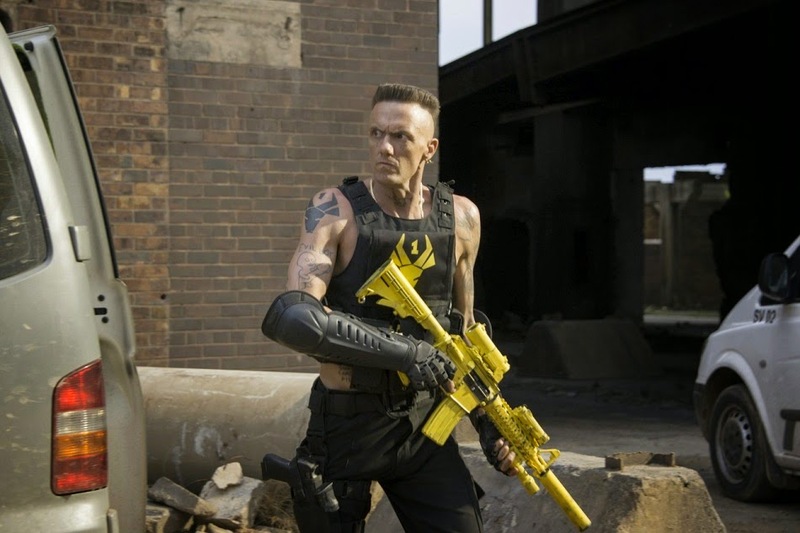 Bright yellow and pink colored guns do not reek of toughness. As well, Hugh Jackman's character is flat, one dimensional, a waste of his talents. The designs for the Scouts and the Moose are not particularly original as they remind me of a Star Wars droid and Robocop's ED-209 respectively. The saving graces for the film are Chappie (Sharlto Copley) whose movements are amazingly lifelike given its appearance and its behavior. 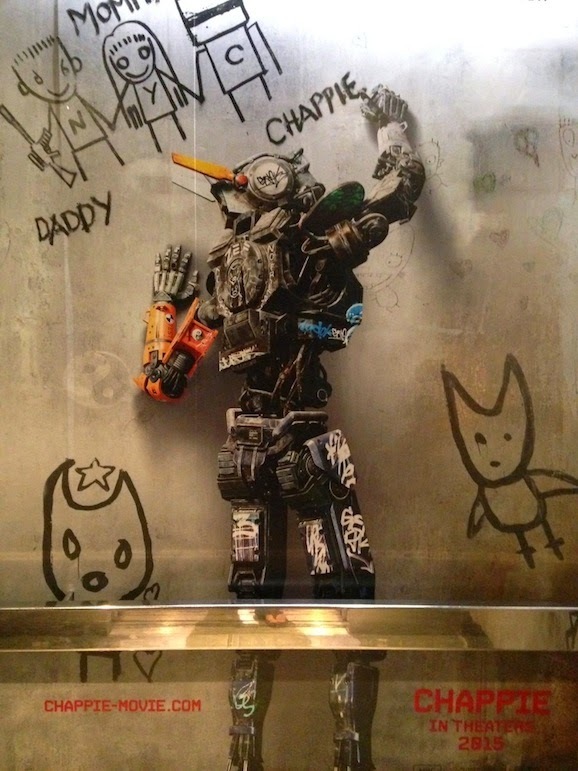 There are a few action scenes but not enough to satisfy as a lot of time is spent on the growing up and learning process for Chappie. Overall, I would recommend the film only if you are looking for a more light-hearted sci-fi film. Yes, there are dark undertones to the movie like violence and drugs, but that is glossed over with a whole lot of silliness. Not to say that this movie is for kids, but it sure seems to be the direction that they were going for. The absurdity of some parts makes it difficult to enjoy such as how frequently and easily the guard key, that changes the Scout's programming, changes hand throughout the film when it is marketed as being so well protected. Things like that add up to make this the most disappointing film compared to Blomkamp's District 9 and Elysium.